There’s been much discussion about what Mark Zuckerberg and Facebook employees thought of “The Social Network.” The picture it paints of their CEO isn’t pretty, and such powerful storytelling penetrates the mind of pop culture. But the filmmakers did Mark Zuckerberg a favor. There’s been much discussion about what Mark Zuckerberg and Facebook employees thought of The Social Network. The picture it paints of their CEO isn’t pretty, and while its writer Aaron Sorkin admits its “total fiction”, the filmakers know only too well how powerful storytelling penetrates the mind of pop culture. That’s why Mark Zuckberg should be so happy. Let me explain. It’s been a tough year for Facebook with PR flame wars over everything from privacy to his donation of $100 million to support Newark schooling. It was almost as if, after two years of pushback from Facebook users, privacy concerns, senate hearings, sweaty interviews, and misinterpreted statements in the press, that the tide was turning against the world’s most powerful social network. That’s why this movie couldn’t have come at a better time. The Social Network does something Facebook could never do. It drains the venom of ill will out of popular culture. By allowing filmmakers to take the brand out for a public thrashing, frustrated Facebook users and critics alike get to see their anger and distrust played out on a public stage. While Facebook–the brand–is getting royally bruised, the company is quietly recovering. WIRED magazine goes further stating that Zuckerberg should be thrilled that Facebook was the first Silicon Valley company to have a compelling movie made about it. Not Apple, not Google, not Microsoft, but Facebook. Silicon Valley has been transforming the world for decades yet the brand remained relatively unknown and un-marketed until this movie. As such, The Social Network will not only raise the celebrity status of Facebook even higher, it will drag Silicon Valley with it. The same dynamic was at work over the widely discussed and parodied Tiger Woods commercial in which he stares at camera while we listen to the voice over of his father. Issues of taste aside, I believe the commercial did a critical job for the Tiger Woods brand. At the height of media coverage of his extra-marital affairs, there was enormous ill will, disbelief, and disappointment among his fans and the public that had nowhere to go. The story could have dragged on for months. Instead, the commercial became a pinata for the brand allowing much of the pent up emotion to be misdirected at the ad. By doing so, it allowed the story to fall out of the news cycle sooner as interest waned. There’s no telling whether this was a conscious strategy but judging by the delight of the press and public to attack the ad, it certainly had this effect. There’s nothing like a good argument to make everyone feel better. The disgruntled parties feel heard, emotions are vented and everyone gets a little closer to moving on. In that sense, The Social Network could not have come at a better time, and the Tiger Woods took some hits instead Tiger. In such circumstances, brand-bashing is much kinder than anything a brand would have to do for itself to get back on track. 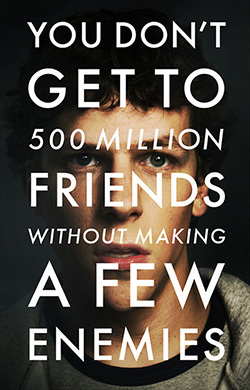 Do you agree The Social Network helps Facebook? What about the Tiger Woods ad? Or do neither have any real effect?